We carry a large selection of World War I and World War II Gear. We can outfit any soldier. These are reproductions from World War I and World War II. We have jackets, pants, overcoats, field caps, greatcoat, German camouflage, trousers, tents, helmets, uniforms and camouflage. Authentically correct German Field Gear and Equipment from World War II - Belts, Magazine Pouches, Y straps, Zeltbahnen, Tunic Hooks and More. A vast variety of authentically correct German uniforms and camouflage pattern uniforms from World War II originals. Our Military Holsters and Accessories section features US and German WWII Holsters, Gun Slings and Accessories. Assorted WWI, WWII and Military Letter Openers from CAS Hanwei. Historical miniature replicas of full size Fighting Knives, Daggers and Bayonets; these miniatures have details like their full size counterparts. Authentically correct United States Field Gear and Equipment from World War II - Webbing, Cartridge Belts, Gloves, Packs, Shovels and More. A vast variety of authentically correct United States GI Uniforms and Camouflage pattern uniforms from World War II originals. WWII Era Military Knives, Daggers, Swords and Bayonets. Functional and Decorative Replicas. Every army involved in WWI and WWII used helmets to protect their combat troops. 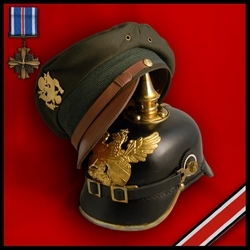 We offer a large variety of reproduction helmets that will meet the needs of Re-enactors as well as collectors.